Apple’s macOS simultaneously offers the world’s most streamlined default browser, and the world’s most bloated default music player. And one has a bad habit of constantly launching the other. 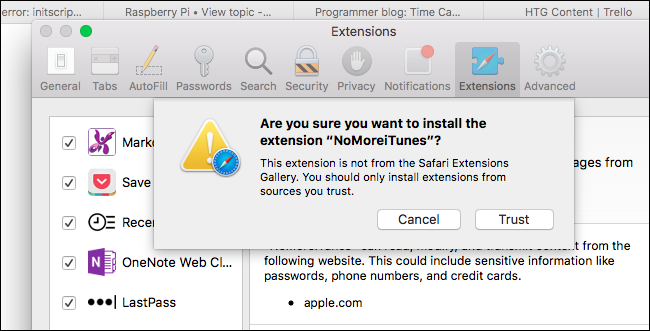 If you’re tired of Safari automatically launching iTunes, here’s how to stop it. No More iTunes is a free extension for Safari that stops iTunes from loading when you open an App Store page. It’s quick to install, and works. To get started, head to the No More iTunes page. Click the download button. You’ll find the extension in your downloads folder, as a .safariextz file. To install, simply open the file. You’ll be asked whether you trust the extension. Click “Trust” and you’re done: the extension is now installed and running. Go ahead and open up any App Store listing. 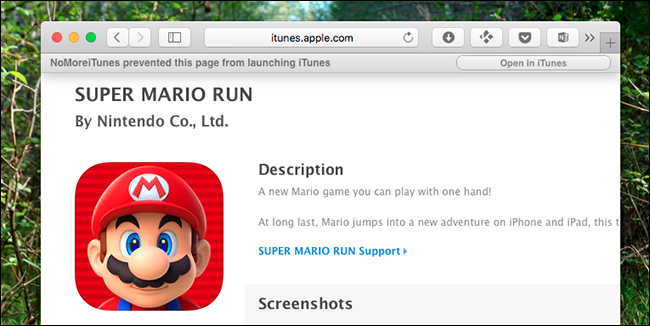 You’ll be happy to note that iTunes will not launch, allowing you to look at the screenshots and other information without opening an entirely new program. If you want iTunes, however, you can still launch it: there’s a bar across the top of the window that allows you to do just that, or you can click the blue “View In iTunes” button below the app’s icon. This lets you look at the complete review collection and other information, when you want to. Now that you’re done with that, you can also stop your Play/Pause key from launching iTunes. Then you’ll really never have to see that bloated app again.